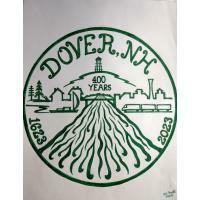 DOVER, N.H.—JANUARY 29, 2019—Dover’s 400th Anniversary Committee recently unveiled the logo to be associated with Dover’s 400th birthday celebration, in 2023. The art work was conceived by Deborah Ballok, Dover resident and retired visual arts teacher. The logo will be used on anniversary collateral and merchandise to help raise revenue to offset the costs of the celebration. Ballok graduated from Southern Connecticut State University with a Bachelors of Science in Visual Arts Education. She worked as a visual arts teacher for 35 years, twenty years at Hudson Memorial Middle School, and another fifteen at Alvirne High School before moving to Dover. Andrew Galt, Zachary Koehler, Tom Massingham, Kathleen Shannon, Douglas Steele, Karen Weston, and Robert Carrier.